This afternoon I visited Real Art Ways to take another look at Hong Hong’s show Dark Segment. Hong’s presence is as alluring as her mystical creations. She works alone, usually at dusk or dawn, and the process of beating and spreading the Kozo fibers onto her massive mold is arduous. Her current show includes fragments from this prior show, but these pieces have been cut up or are peeking out behind swathes of the newer works. Many aspects of Hong’s process are consistent between the two exhibitions, but Dark Segment shows a more playful and improvisational side of Hong’s practice. You can read my text, originally published in the “Invention” issue of the Art21 magazine, here and below. SEPT / OCT 2017 ISSUE — "Invention"
During an artist’s residency at the Morgan Art of Papermaking Conservatory and Educational Foundation in Cleveland, Ohio, Hong Hong often arose before the sun, sometimes as early as 4:00 a.m. “I’m interested in that time because everything is in transition: the light, the sky, the sounds of people waking up, and even myself,” said Hong. Working alone, Hong spread layers of Kozo fibers onto her gigantic handmade paper mold, measuring eight by twelve feet. The twelve large sheets of paper that Hong made over two months are featured in the artist’s current exhibition, All the Light in a Vivid Dream, at Real Art Ways, in Hartford, Connecticut. 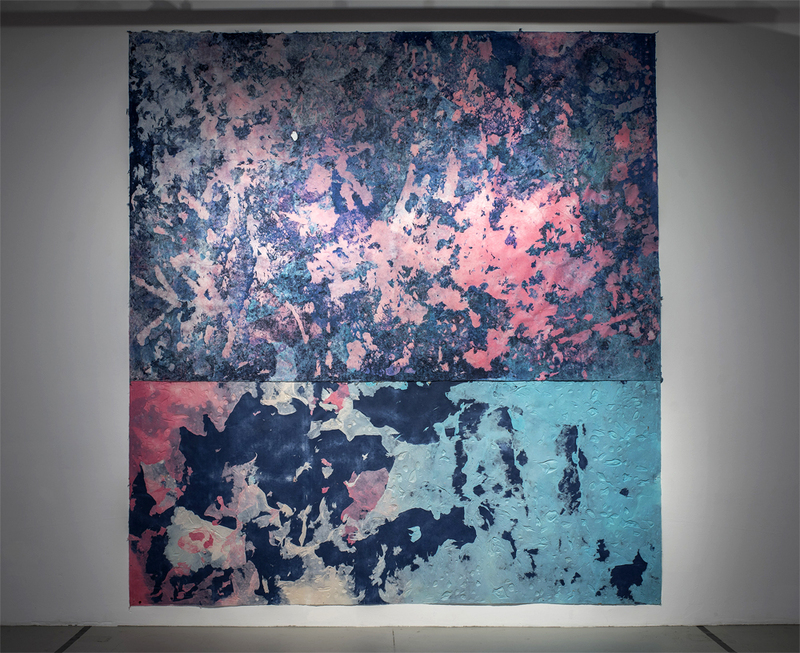 The deep blues and bright pink colors of the paper works in Hong’s show engulfed me as I entered the gallery, where seven sheets have been overlaid to create three huge square pieces. Paper at that scale felt monumental, yet when I approached the works, the surface of the paper appeared fragile and sensitive. Hong grew up in Hefei, China, and her parents allowed her to draw all over the walls of their apartment. Hong’s drawings of giant whales and abstract scrawling flooded her vantage point as a child. The taller Hong grew, the higher the drawings rose on the walls. As an adult, she endeavored to recreate this experience of inundation. Hong Hong. Selection from All the Light in a Vivid Dream series, 2017. Kozo, repurposed paper, dust, sun, water; 150 x 140 in. Photographer: John Groo. Courtesy of Artist and Real Art Ways (Hartford). © Hong Hong. Trained as a painter, Hong made several massive paintings on canvas before switching to paper, a more challenging and unforgiving material. As a graduate student at the University of Georgia, Hong developed her unconventional papermaking practice over nearly a year of trial and error. Her immense paper works are made without many of the tools necessary for traditional papermaking: Hong does not use a Hollander beater, hydraulic press, pellon, or felts; she does not work inside a wet studio or let her works cure within a drying box. The modular construction of her mold and deckle allow her to travel with her mobile paper studio. Hong’s technique combines two traditional forms of papermaking—Tibetan and Japanese—but her work’s scale and process are contemporary. Plastic sheets, fingers, and the weather leave traces of the passing time as Hong pours and disrupts different layers of dyed kozo fibers, which dry outdoors, exposed to the elements. The process is a performance, a back-and-forth between creation and destruction. The sheets are dotted with holes from rakes or powerful water hoses; small indentations from the artist’s hands bespeckled a corner, and in other places, the surface appeared as smooth and unblemished as still water. Within these textural works are remnants from previous paper works, and eventually all the works in the current exhibition will be wetted to pulp and reformed into new paper. Both the cyclical nature of Hong’s process and the color palette of the work evoke the landscape. Feelings of the horizon and seascapes naturally emerge. Hong explained, “I think of them as photographic stills of the things that might shape a person’s experiences of the land.” The blue and pink colors represent two phases of the process: the water and sun, the sea and sky. The viscosity of the water affects how the papers will settle as they dry in the sun, forming copies of the meteorological conditions on a particular day. The saturation of the color varies as a result, from the strength of the sun throughout the day and changing weather. “In a way [the sea and sky] are really abstract places,” Hong added. During her stay in Cleveland, Hong walked along Lake Erie in the evenings, looking out to the horizon, where the sea and sky meet. Hong said all the other people at the lake were also watching the horizon; she believes people are naturally transfixed by the idea of the horizon, which is at once present but never fixed. Hong’s next project, a yearlong site-specific series of outdoor installations using color-changing plastics, called Everlasting Ephemera, will continue her exploration of the landscape, its changes, and its cycles. All the Light in a Vivid Dream was made with support from the Edward C. & Ann T. Roberts Foundation. 1. All quotes from the artist are from a conversation with the author at Real Art Ways on August 18, 2017. My upcoming review of Hong’s current show will be published in the January/February issue of the Art New England magazine (available in print only at your local bookstore). Born in Hefei, China, Hong Hong is an interdisciplinary artist whose practice spans paper-making, sculpture, installation, and performance. Hong earned her MFA in 2014 from the University of Georgia and her BFA in 2011 from the State University of New York at Potsdam. Her work has been exhibited across the United States in shows at the Newhouse Center for Contemporary Art, Pittsburgh Center for the Arts, Madison Museum of Fine Art, New Mexico History Museum, and Georgia Museum of Art. Hong is the recipient of grants and commissions from the Foundation for Contemporary Arts, Center for the Arts at Wesleyan University, the Edward C. & Ann T. Roberts Foundation, the Greater Hartford Arts Council, and Artspace New Haven. Hong currently lives in Connecticut.